It’s been a bit of a shock to my system returning from sunny Spain on Tuesday to find cold and rain and not a sign of summer remaining in London. It’s hard to imagine that just a few days ago I was lying by a pool sunbathing and we were eating outside each evening in the still-warm air, sitting talking till late. Just as I did this time last year when I got home from a holiday there, I’ve been bringing a little taste of Spain into my day by making tostadas for lunch. Tostadas are traditionally eaten at breakfast time in Spain, though are also served as a snack or tapas. Linda and I ate them in a cafe when we went to Valencia for the day, having them with coffee when we arrived at about 10.30 in the morning. 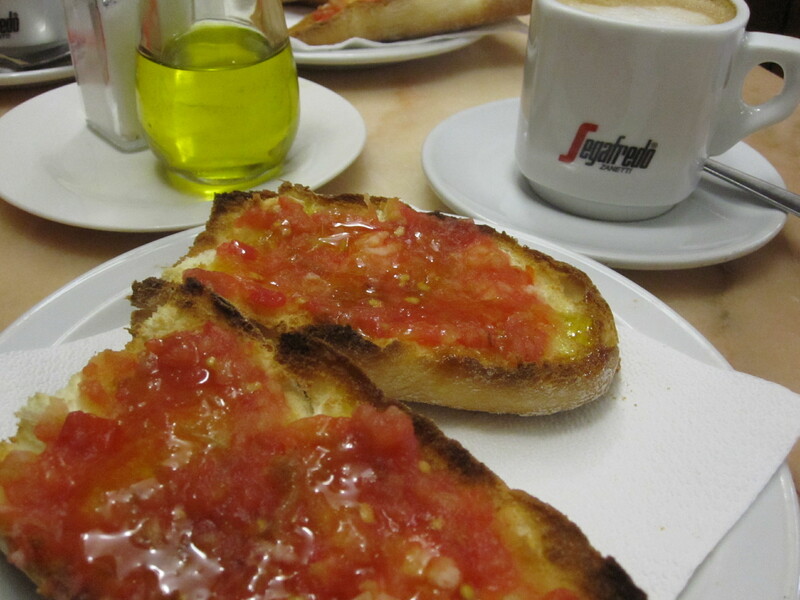 With good bread, fresh tomatoes and fruity extra virgin olive oil, it makes a much more sensible and healthy breakfast to set you up for the day – or a morning’s sightseeing and shopping as we had planned – than a sweet pastry with coffee. 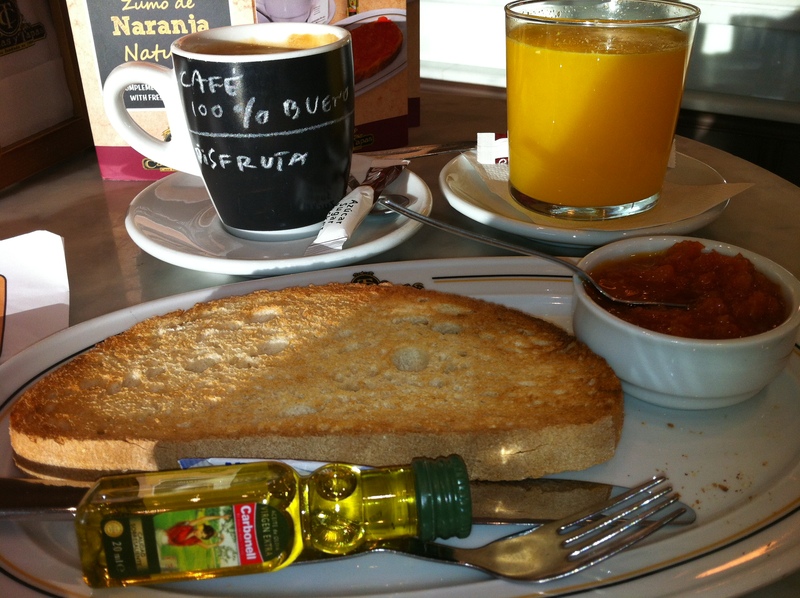 Another day, after going round the Calpe market, we ate tostadas with coffee at about midday … too early for lunch but a little snack was definitely needed. When we went out for paella at lunchtime on Sunday, a kind of make-your-own tostadas came for us to nibble on with wine while the paella was being cooked. As often happens, the tomato pulp was served separately in a bowl so you could first dribble olive oil over the toast and then add the tomato and season with salt. 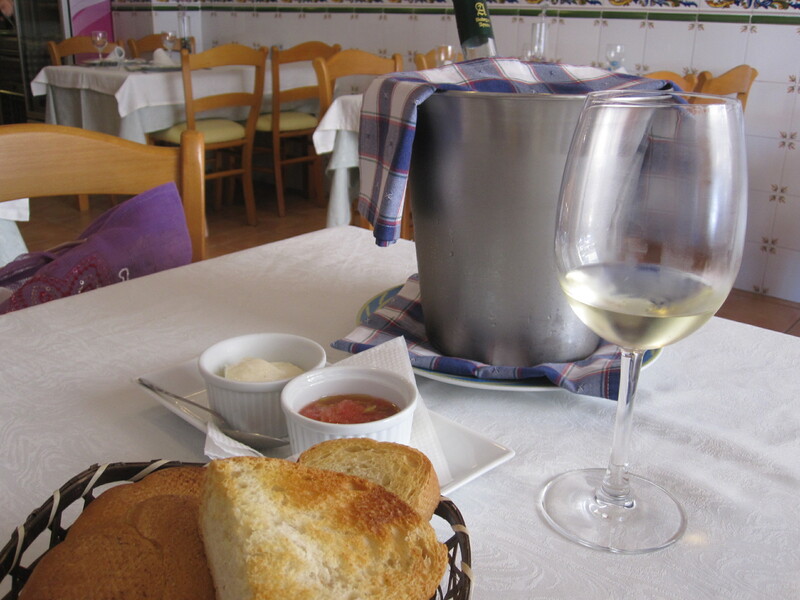 In the restaurant there was also a bowl of aioli and the garlicky sauce is a reminder that some people like to rub a cut clove of garlic over the bread before adding the oil and tomato. When served for breakfast it’s quite common to not have tomato at all but just dribble over olive oil and add a bit of salt. I first saw this a couple of years ago when Linda and I spend two or three days in Cartagenga – a really beautiful place – and used to breakfast at a bakery where tostadas were being turned out on a human conveyor belt at a great pace. They had a huge special grater for grating the tomatoes, the pulp collecting in a bowl underneath and then being spooned over the toasted baguette or bread. Tostada was my choice for breakfast in Alicante airport on Tuesday morning, waiting for my flight home. Canas y Tapas is a typical Spanish bar serving, yes!, tapas … but as it was only about 9 in the morning, I settled for fresh orange juice (genuinely fresh and squeezed in front of me … mmm … delicious), tomato tostada and coffee. As you can see, the tomato came separately with a sweet little bottle of olive oil, which I couldn’t resist bringing home to maybe refill for a picnic sometime. 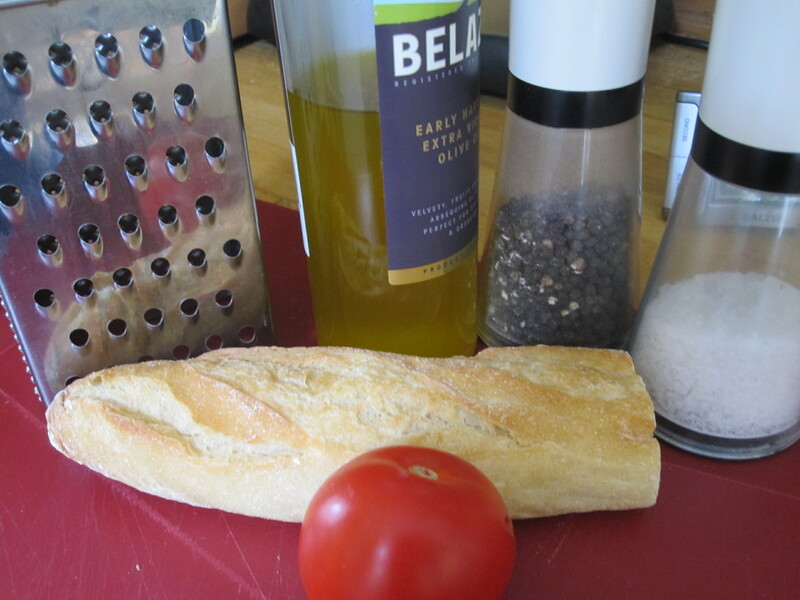 There’s been no chance of eating in the garden at lunchtime this week, but with a lovely traditional baguette from Paul, some gorgeous Belazu Spanish olive oil, and ripe tasty tomatoes, I’ve done a quite good impression of tostadas. Cut a good chunk of baguette – about 20cm – in half lengthwise and toast lightly. 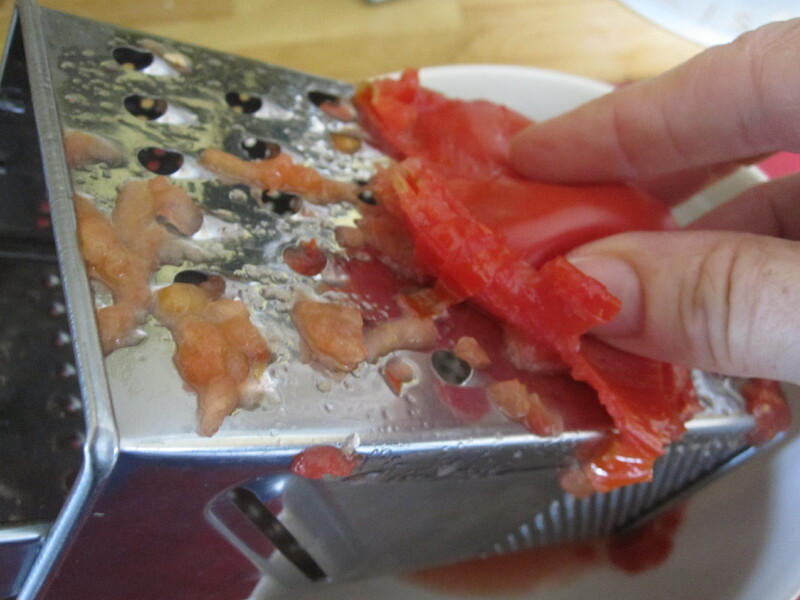 Meanwhile, stand a grater over a bowl and press the tomato in and start grating. You’ll find the pulp comes out easily and you are left with just the skin at the end. Now drizzle a generous helping of olive oil all the way over your toast. 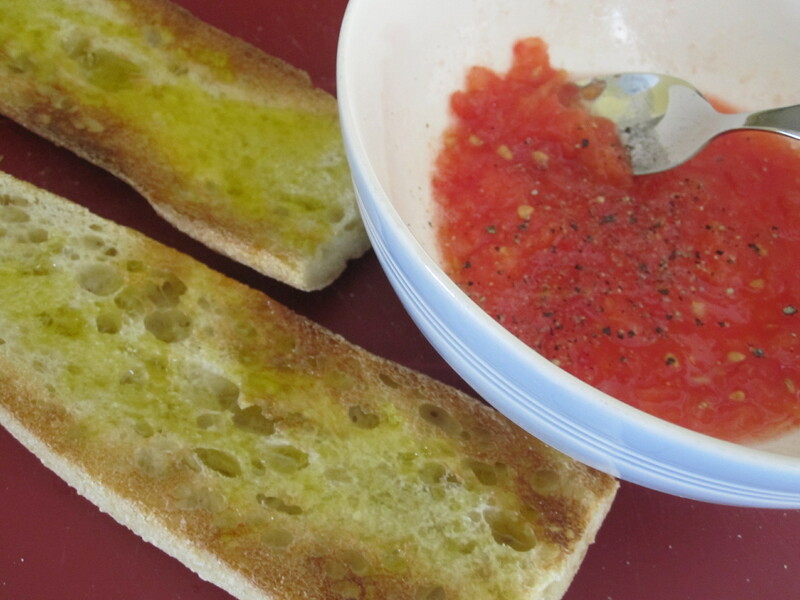 Season your tomato pulp with some salt and pepper, then spoon over the bread. I served mine with slices of Spanish Pyrenean mountain cheese and a few olives. It’s hard to describe how wonderful tomato on toast prepared in this way is – and of course it’s amazingly quick and simple too. 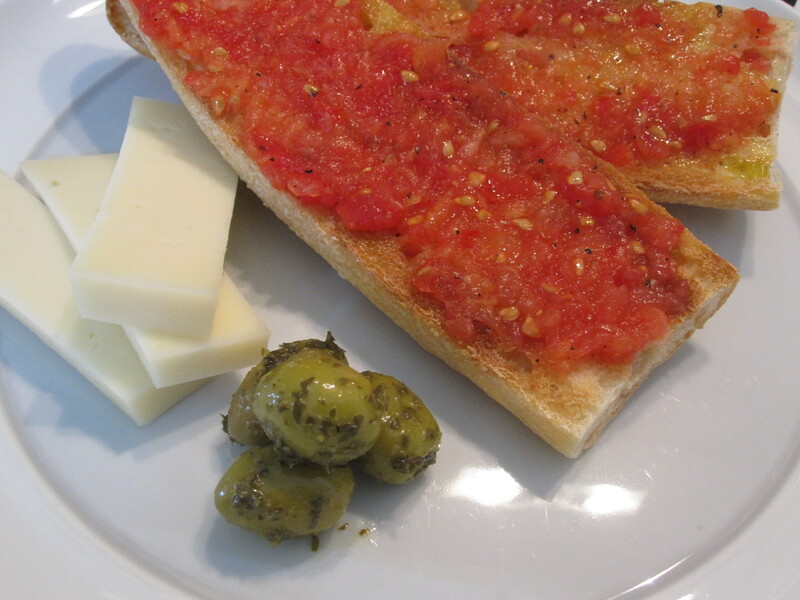 The fact that I’m a great lover of good bread, tomatoes and olive oil undoubtedly helps, and the quality of the ingredients is important, but it does add a nice little touch of glamour to a quick snack and of course reminds me of lovely Spain. If I close my eyes as I take a bite, a little ray of sun shines through my day. Tostada sounds like something Adam and Eve would have enjoyed before apples ruined everythey ! Yes … as long as they’d discovered fire for the toast! Thank you Alex. And so surprisingly special for something so simple.